There are over 175 marketing ingredients in your “marketing pantry” – there’s plenty to select from! The key is strategically selecting the right ingredients for your particular business. Marketing ingredients are not just the obvious things like your business card, website or advertising, but everything in your business. Because everything you do, (and don’t do), sends a message: how you answer your phone, the quality of your service and the cleanliness of your facilities all send a message. Apple is a master of this principle. Not just their product design or ease of use, but every touch point sends an experiential message. Unwrapping an Apple device is the hi-tech experiential equivalent of Tiffany’s famous turquoise box. Entering an Apple store one is greeted with the Apple employees smile, immediate help, and friendly direction. Technical support through their “Genius Bar” or by telephone is virtually unmatched in the hi-tech sector. The enthusiasm of every Apple employee is uncanny; sending an unwavering message and desire to please. They clearly have no sour apples in their ranks! The result is a marketing ingredient like no other: an army of ecstatic Apple customers — a true marketing powerhouse. 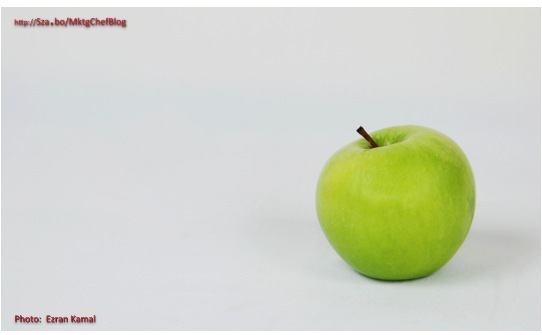 Literally every “bite of the Apple” is a marketing ingredient that supports their irresistible message and furthers demand for their offering. Every touch point with a customer or prospect is a marketing ingredient and an opportunity to send a message. What message are you sending through all your touch points? Excellent point, Andrew. Since I purchased my iPhone 4S back in November 2012 and experienced the product and their customer service, I had no idea how great Apple was at this. You are spot on about EVERYTHING we do is marketing.